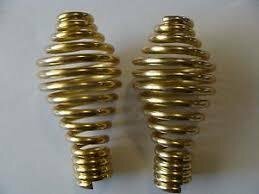 These are Replacement Spring Handles used on many stoves. They are Brass Plated measuring 3 1/2" inches long and will fit a 5/16" to 1/2" Shaft. These are sold individually, if you need a pair, please enter quantity 2.